Official internal data on the Abbott Government’s performance half-way into its first term is highly disturbing. Alan Austin reports. AUSTRALIA was well-managed from 2007 to 2013. Now, in contrast, many economic and social indicators are deteriorating badly. Those two claims are not from the Abbott Government’s hostile opponents. They are derived from the Government's own publications. Virtually all recent periodical reports have revealed the abject failure of this Government to match the performance of its predecessor — despite much more benign global conditions. They confirm breaches of many pre-election commitments. Latest Bureau of Statistics (ABS) figures show the jobless rate over the last six months fluctuated between 6.1 and 6.4%. At the September 2013 election, Australians looking for work numbered 696,000. ABS data shows this is now above 777,000. Last week’s ABS Corrective Services report shows unsentenced prisoners have “risen nationally by 13 per cent (995 persons) since December 2013”. ABS report no. 4517.0 shows imprisonment of Indigenous people rose each year from 2007 to 2013 by an average of 4.1% — far too rapid a rate. In the first full year of the Abbott Government, however, the increase was 9.9%. According to Indigenous authorities this is the result of cut-backs to vital services. Finance Department monthly reports in 2013 show net debt left by Labor was $178.1 billion. This, according to Abbott, Treasurer Joe Hockey and others in the Coalition was “a debt disaster”. So is the debt now falling towards the $148 billion mark? Afraid not. This week’s Finance report shows net debt in February was $255 billion. That is up $76.9 billion, or 43.2%, in just 15 months — with no global financial crisis (GFC) and no productive infrastructure to show for it. The Finance reports which show net debt also reveal other failures. Total net worth – all assets minus all liabilities in the federal government general sector – is a critical one. During the GFC which the Rudd and Gillard Governments managed, Australia’s net worth shifted from positive to negative in January 2010. In other words, total liabilities began to exceed total assets. Net liabilities peaked under Labor at -$259.1 billion in December 2012. Thereafter, the position gradually improved as assets increased and debts were paid off. By October 2013, the net worth reached -$210.5 billion. That’s a gain over that ten month period of almost $50 billion. Since then, under the hapless Abbott regime, net worth has plummeted. This week’s figures show liabilities have blown out to $712.8 billion, leaving the net worth at an all-time low of -$301.5 billion. That is a deterioration of $91 billion. In 15 months. Perhaps the most devastating recent document for the Abbott Government is the Trade Department’s, Why Australia: Benchmark Report 2015. This lays bare many of the outright lies Abbott and Hockey have been repeating for years. The Trade Department report refutes these claims. Both those quotes are based on data published in October 2013. Only Singapore and Hong Kong have less red tape than Australia. Through the GFC, Australia’s economy was better-performed than any other developed economy. Australia’s economic and social indicators have deteriorated significantly over the last year and a half. They show signs of worsening further. 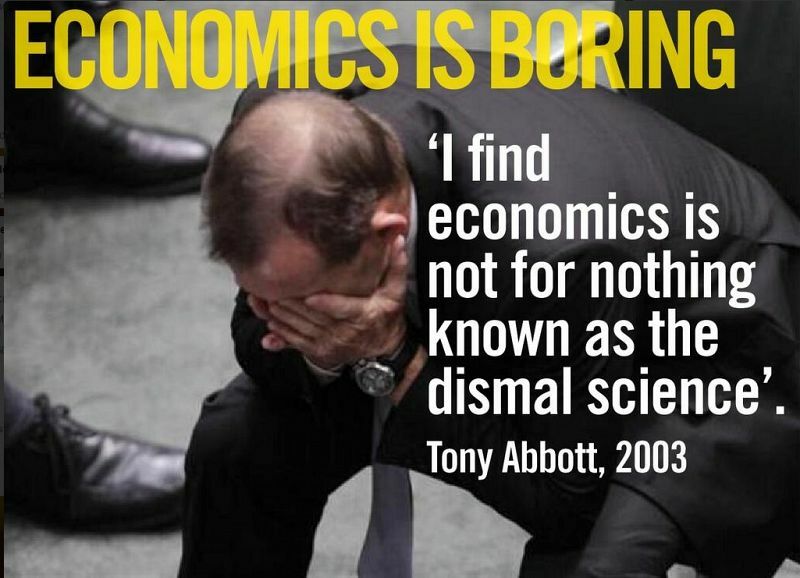 Don’t believe anything Tony Abbott or Joe Hockey say. They lie consistently.